With delicious, quick and exciting street fare it’s no wonder that Eat Chicken Wraps is often hailed as one of the best food trucks in all of Vancouver. Therefore, when you turn up to Eat Chicken Wraps’ unassuming food truck, which stands on the corner of Robson and Howe Street from Monday through to Saturday, you can expect to be fed some of the tastiest food in town. Like their name suggests, Eat Chicken Wraps specialises in chicken wraps. Not just your standard chicken wraps however, which can at times be both bland and soggy but rather delicious, fresh tasting wraps packed with flavour. Although the menu is on the small side, it does boast a selection of international options to choose from: buffalo chicken wraps, chicken caesar wraps, “kung pao” chicken lettuce wraps, chicken al pastor wraps, and the food truck’s signature dish, the hoisin chicken wrap. At $7 the hoisin chicken wrap, is an inexpensive and great tasting eat! It is light, flavoursome and filled with a delicious mixture of five spiced organic chicken, Asian salad, pickled radish, green onion, and hoisin sauce. It is a truly winning combination! While the hoisin chicken filling is exceptionally good, it must be said that it is the actual wrap itself that sets it apart from the others on offer. 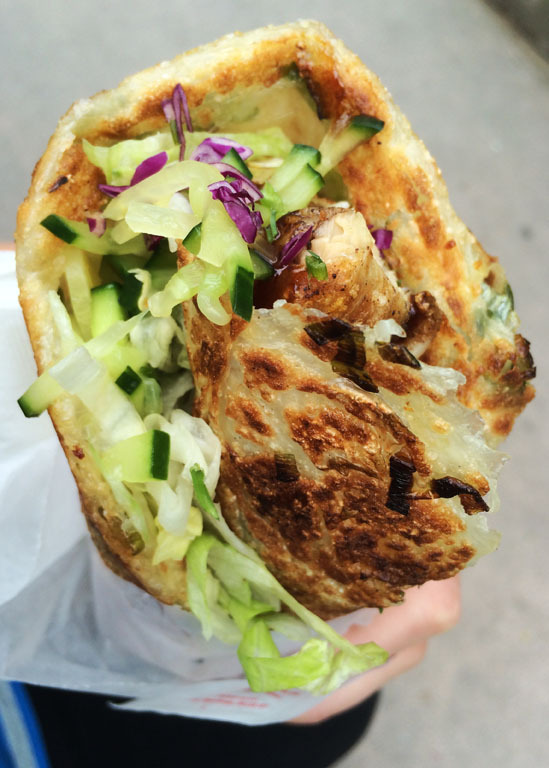 Instead of using your typical tortilla, the chefs at Eat Chicken Wraps roll the hoisin flavoured chicken in a crispy Chinese pancake. A unique and delectable way to package this lunchtime (or dinnertime) treat. 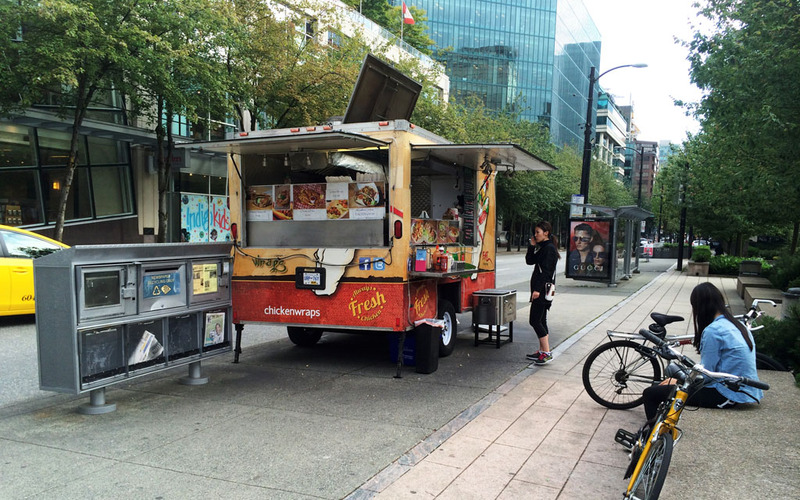 The Eat Chicken Wraps food truck, which is owned and run by husband-and-wife duo Dan and Sammy is the perfect spot to grab a quick bite to eat in Vancouver’s Downtown, especially if you find yourself shopping along Robson Street. What’s also great about the food truck’s location is that there are a whole heap of benches nearby, where you can sit and enjoy your wrap. 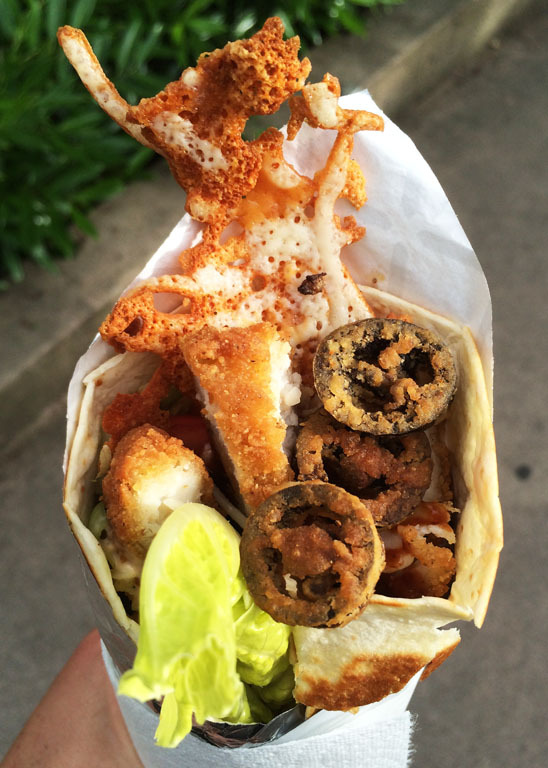 Go on, try these wraps for yourself when you’re in the area, you will not be disappointed! 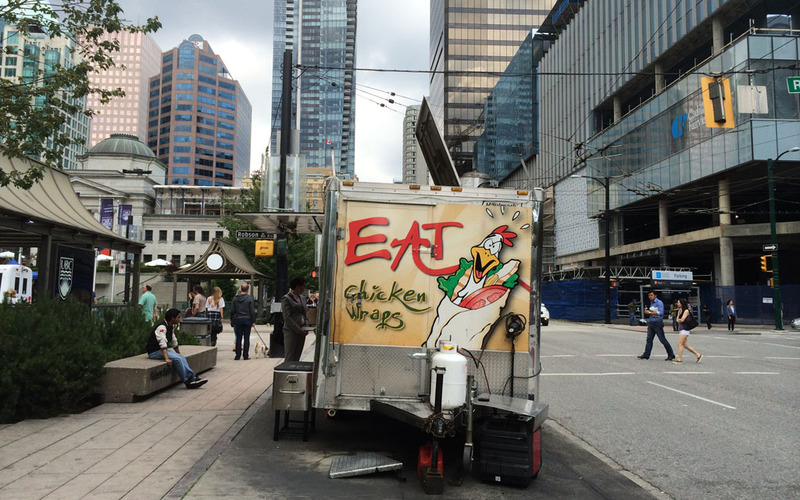 Located at the corner of Robson and Howe Street from Monday through to Saturday, the Eat Chicken Wraps’ food truck serves cheap, fast and delicious tasting wraps.